For other uses, see Osmium (disambiguation). 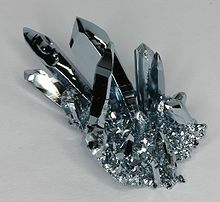 Osmium (from Greek ὀσμή osme, "smell") is a chemical element with symbol Os and atomic number 76. It is a hard, brittle, bluish-white transition metal in the platinum group that is found as a trace element in alloys, mostly in platinum ores. Osmium is the densest naturally occurring element, with an experimentally measured (using x-ray crystallography) density of 7004225900000000000♠22.59 g/cm3. Manufacturers use its alloys with platinum, iridium, and other platinum-group metals to make fountain pen nib tipping, electrical contacts, and in other applications that require extreme durability and hardness. The element's abundance in the Earth's crust is among the rarest. Osmium has a blue-gray tint and is the densest stable element; it is approximately twice as dense as lead and slightly denser than iridium. Calculations of density from the X-ray diffraction data may produce the most reliable data for these elements, giving a value of 7004225870000000000♠22.587±0.009 g/cm3 for osmium, slightly denser than the 7004225620000000000♠22.562±0.009 g/cm3 of iridium; both metals are nearly 23 times as dense as water. Osmium is a hard but brittle metal that remains lustrous even at high temperatures. It has a very low compressibility. Correspondingly, its bulk modulus is extremely high, reported between 7002395000000000000♠395 and 7011462000000000000♠462 GPa, which rivals that of diamond (7011443000000000000♠443 GPa). The hardness of osmium is moderately high at 7009400000000000000♠4 GPa. Because of its hardness, brittleness, low vapor pressure (the lowest of the platinum-group metals), and very high melting point (the fourth highest of all elements, after only carbon, tungsten, and rhenium), solid osmium is difficult to machine, form, or work. Wikimedia Commons has media related to Osmium. 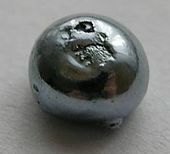 Look up osmium in Wiktionary, the free dictionary.